A Cesarean section (also spelled "Caesarian" or "Caesarean") is a surgical childbirth procedure in which the baby is delivered through a surgical incision into the womb. Today Cesarean sections (or C-sections) are an exceedingly common method of childbirth accounting for a third of all babies delivered in the United States. At one point in time, however, surgical delivery via a C-section was an option of last resort that often had horrific outcomes for mother and baby. 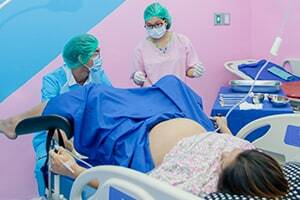 This page will examine the origin of C-sections and how the procedure gradually evolved into what it is today. The concept of surgically delivering a baby by cutting open the abdomen and womb of a pregnant mother dates back to at least the late bronze age, but the very first C-section likely occurred even earlier that. In fact, some type of crude C-section with a stone cutting tool was probably the first surgical procedure in human history. However it was the ancient Romans that first developed and documented C-sections as a medical procedure. The Romans actually had a written law called the Lex Caesaria which stated that if a woman died during childbirth her womb had to be cut open and the baby removed. image002.jpgThe law actually had nothing to do with saving babies. Rather, it was motivated by Roman religious custom which did not allow burial of woman who was pregnant. Contrary to popular belief, cesarean sections were not named after the emperor Julius Caesar who was reportedly born via a C-section. The term "caesarean" is actually derived from the latin word caesus meaning "to cut." During Roman times and for several hundred years thereafter, a Cesarean section was not something that the mother was expected to survive. Until fairly recently, women routinely died during or shortly after childbirth. A C-section was usually not even considered until the mother was dead or very close to being dead. It was essentially a last ditch attempt to extract the baby from a dying mother. Even if the mother was still alive, once the incision in her abdomen was there was no hope of saving her. Even if someone had the anatomical skills to stich her back together, she would almost certainly die from infection. The outlook for the baby was not much better. Historical records suggest that babies delivered via C-sections were rarely alive let alone healthy. Most probably died from prolonged oxygen deprivation. 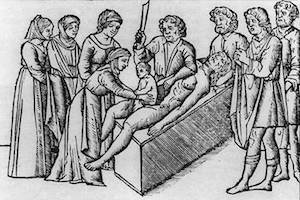 As knowledge of medicine and science advanced into the renaissance period, the nature of C-sections began to undergo a drastic transformation. Writing accounts of successful C-sections survived by both mother and child begin to appear in the historical record around the 1500s. By the early 1600s descriptions of the procedure began appearing in medical texts and midwifery books, which first coined the term C-section as opposed to Cesarean procedure. Notwithstanding the new descriptive name and increased attention, C-sections continued to be a dangerous, often life threatening proposition well into the late 19th century. In the latter half of the 19th century, the medical profession and particularly the field of surgery was dramatically improved by a series of technical innovations and scientific discoveries. More than anything else, the emergence of anesthetics revolutionized C-sections. Anesthesia did more than just spare the mother from the extreme pain, it effectively eliminated the risk of maternal death from shock which was one of the leading causes of C-section fatalities. Prior to anesthesia, when a baby was hopelessly stuck doctors would perform a very unpleasant procedure called a Craniotomy which literally involved crushing the baby's skull to get them out of the mother. With the availability of anesthesia the C-section quickly became a much preferable alternative to the Craniotomy. Even after the emergence of anesthetics, maternal mortality rates for C-sections remained very high in the early days because women routinely died from post-operative infections. This gradually began to change towards the end of the 19th century as germ theory and modern bacteriology developed. By the start of the 20th century, the advancement of anesthesia and antisepsis had made C-sections practical and safe enough for doctors to start focusing on refining and improving the procedure. By around 1920 these various advancements has shaped C-sections into the modern surgical procedure that we are familiar with today. C-sections were no longer viewed as a desperate option of last resort. Now the C-section was being used as a preemptive solution to improve outcomes for mother and baby. Instead of waiting through hours or days of problematic labor before finally resorting a C-section, doctors were performing the procedure at the earliest signs of trouble. At the same time, more and more births were taking place in hospitals. In the 19th century fewer than 10% of births took place in a hospital. By 1938, however, over half of all babies in the U.S. were born in a hospital and by 1955 the number skyrocketed to 90%. Although the "modern" C-section procedure really emerged around 1940, the percentage of C-section deliveries remained under 5%. It was not until the mid-1960s that C-section rates began to dramatically increase, starting a trend that is continuing today. From 1965 to 1985 C-section delivery rates went up over 400% and today about 1 out of every 3 babies is delivered by C-section. This sudden increase is attributable to a number of factors including cultural changes and advancement in technology. Specifically, the emergence of electronic fetal monitoring equipment and the use of ultrasound and sonograms.